Corsair is kicking off the New Year with a bang and a new flagship K95 RGB Platinum mechanical gaming keyboard. From the bottom up, Corsair claims this is its best keyboard yet. 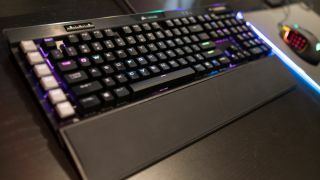 The frame is made of aircraft-grade anodized brushed aluminum, meanwhile, they keys themselves use Cherry’s proven 1.2mm low-travel Cherry MX RGB Speed switches. What’s more this keyboard comes with 8MB of onboard memory to save three separate profiles of custom key assignments and macros to memory and, of course, multi-layer reactive lighting profiles. Speaking of lighting, the K95 RGB Platinum lives up to its name and offers a fully customizable lighting setup that also now extends to a 19-zone light bar running along the top of peripherals frame. Other extras on this keyboard include six side-positioned macro keys, a detachable dual-sided soft-touch wrist rest and a dedicated USB pass through for your mouse or other peripherals. Corsair tells us the K95 RGB Platinum gaming keyboard will be available in late January and is priced at $199 (about £160, AU$275). Alongside its flagship keyboard, Corsair is also rolling out a new Scimitar Pro RGB gaming mouse for MMO and MOBA players. Based on the same its previous Key Slider mouse, the Scimitar features 12 mechanical side-buttons, which in addition to its other traditional buttons adds up to a total of 17. Of course, users will able completely customize each button, tying each to a distinct action and save up to three separate profiles. The mouse also features a 16,000 DPI PMW3367 optical sensor, whose sensitivity can be further calibrated to the type of surface you’re using it on. The Corsair Scimitar Pro RGB gaming mouse is available now for $79 (about £60, AU$110).